For up to 1000mm Focal Length telescopes or screw SolarMax 40 and Tmax on to a PST Personal Solar Telescope for greater contrast. Four items: SolarMax 40 filter, Tmax Doppler Tuner, BF10 blocking filter diagonal and carrying case. This is a new, never used item in excellent condition manufactured in 2003. New old stock. Sold as is. An extremely good value. Can also be used to double stack PST. It's almost like getting the solar filter or the blocking filter for free. Experience first hand the tremendous views of our nearest star! 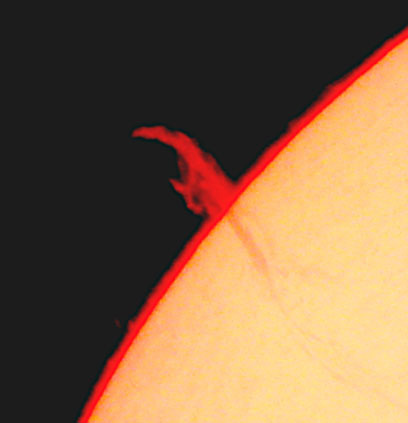 Use your telescope for daytime astronomy. 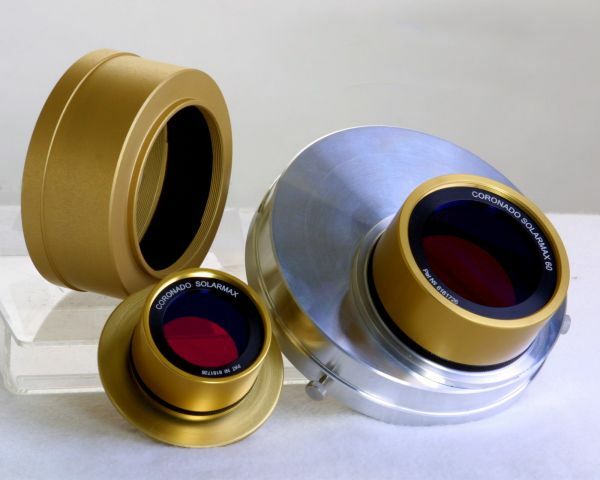 Patented, lower cost filters by Coronado Technology Group allow more people the opportunity to view solar activity. Made in Tucson, Arizona by Coronado and upgraded. 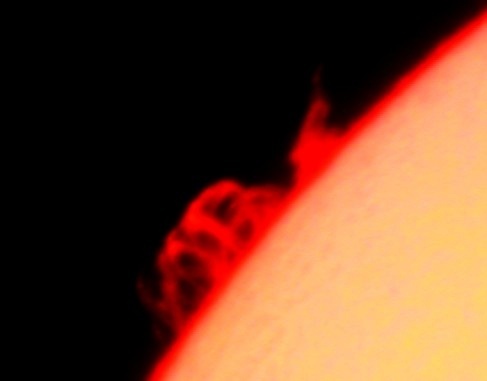 See excellent views of both prominences and surface detail such as plague, flares, filaments etc..
Pictures by Ginger Mayfield using SolarMax 60 on TeleVue 85 refractor. Click on picture for larger view. Coronado filters are shipped via air and are not shipped UPS ground service or with the Post Office. USA sales and shipping only. Has anti-static lens brush, cleaning solution, anti-static cloth, spec grabber. Hats for UV protection, durable, long visor, neck drape, wind clip, Coronado Logo. Wear this hat backwards and use neck drape to block stray light when using solar telescopes. Make your own White Light filter for viewing sun spots with your binoculars or telescope. 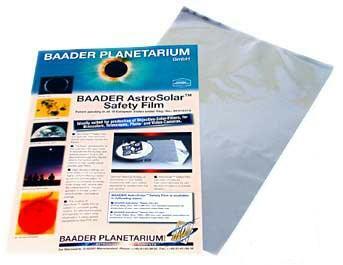 Baader AstroSolar™ Filter material and instructions. Use scissors to cut film. Density 5 (0.00001 transmission) - for visual use. Adapter Plates Use to mount SolarMax filter to your telescope.